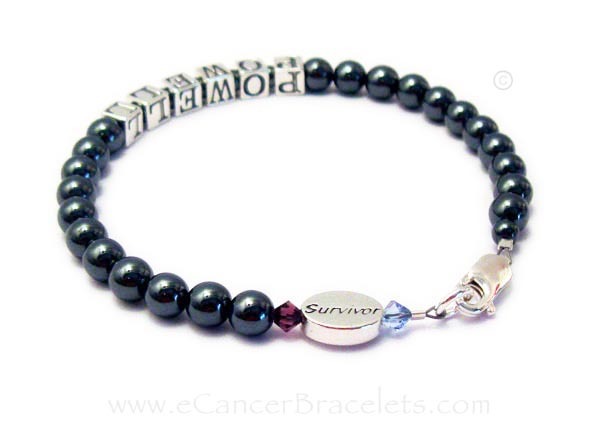 This Survivor (Hope, Courage or In Memory) Bracelet can have a name, word or phrase on it or just the magnetic black Hematite beads with the message bead - Survivor, Hope, Courage or In Memory. You can also write SURVIVOR on it, in 5.5mm letter blocks or another word or name and add a SURVIVOR bead near the lobster clasp. Up to 9 letters are free, additional letters are $3 each. 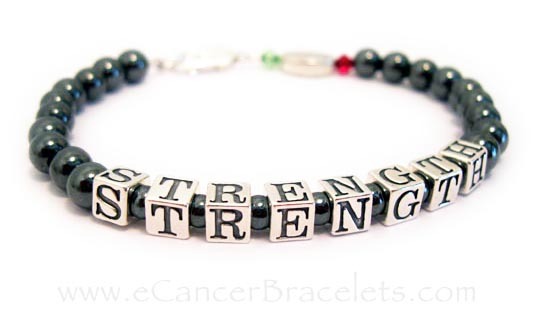 It is shown with a Dark Green Swarovski crystals before and after the Survivor bead which are optional. This bracelet is made with Sterling Silver & magnetic Hematite beads. Questions? Sterling Silver & Magnetic Hematite Bracelet Survivor Bracelet for a Man. Shown with a SURVIVOR beads and Swarovski crystals. Sterling Silver & Magnetic Hematite Bracelet Survivor Bracelet for a Man with FAITH and a SURVIVOR bead. Shown with (free) optional March birthstone crystals. Sterling Silver & 6mm Magnetic Hematite Bracelet Survivor Bracelet for a Man or Woman with STRENGTH and a Courage bead. Shown with (free) optional July & August birthstone crystals. 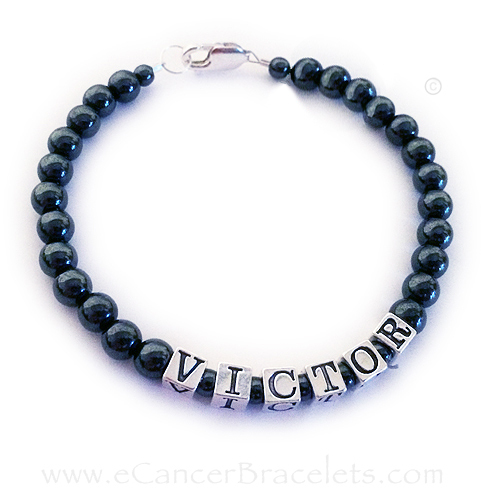 Sterling Silver & 6mm Magnetic Hematite Bracelet Survivor Bracelet for a Man with VICTOR and a SURVIVOR bead. Shown with Green Beads for Liver Cancer Survivor.